Hawaii Preparatory Academy was the top Big Isle team at the boys basketball state tournament. HPA was unseeded in Division II, but trounced Seabury Hall, 76-52, to secure third place. Also in Division II, Pahoa stopped Waianae, 47-42, to take fifth place. No. 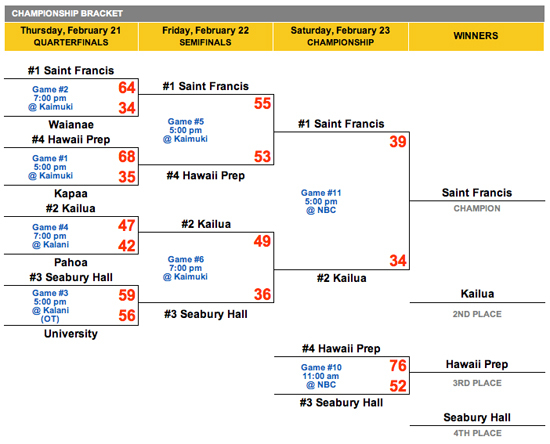 1 seed Saint Francis topped Kailua, 39-34, for the Division II crown. Meanwhile in Division I action, No. 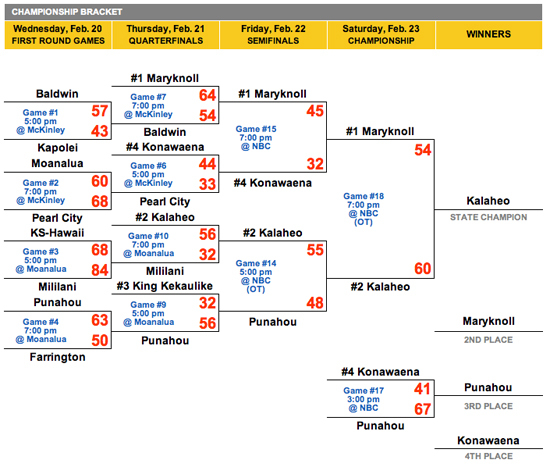 4 seed Konawaena was clobbered by unseeded Punahou, 67-41, and wound up in fourth place. The Division I championship game was a scorcher, with No. 2 Kalaheo needing overtime to knock off No. 1 Maryknoll, 60-54. The tournament wrapped up Saturday evening on Oahu.